I love a good grain salad once in a while...especially quinoa, since it is such a nutrition powerhouse of a grain! It in fact has a higher protein content than that of other grain, as well as a balanced set of amino acids, which makes it a complete protein source. Since I am a runner, I am always looking for nutritionally packed foods such as this. So when I was deciding what type of grain salad to make today, quinoa it was! I decided that I would pack the salad with even more protein and include navy beans, and pine nuts...two of my favorite ingredients. To give the salad some color and added deliciousness, I added asparagus, which I use in everything I can squeeze it into during the spring season, and some fresh basil and scallions for a fresh flavor. I wanted the flavor of the salad to remain delicate, so I decided that a citrus juice based dressing would do...using fresh lemons and oranges for a bright flavor. The salad was nothing short of fresh spring flavors at their best...and of course it was the type of thing that you feel wonderful and energized after eating! Place quinoa and water in a medium saucepan and bring to a boil. Reduce to a simmer, cover and cook until all the water is absorbed about 15 minutes, or when all the grains have turned from white to transparent, and the spiral-like germ has separated. Drain, and let cool. 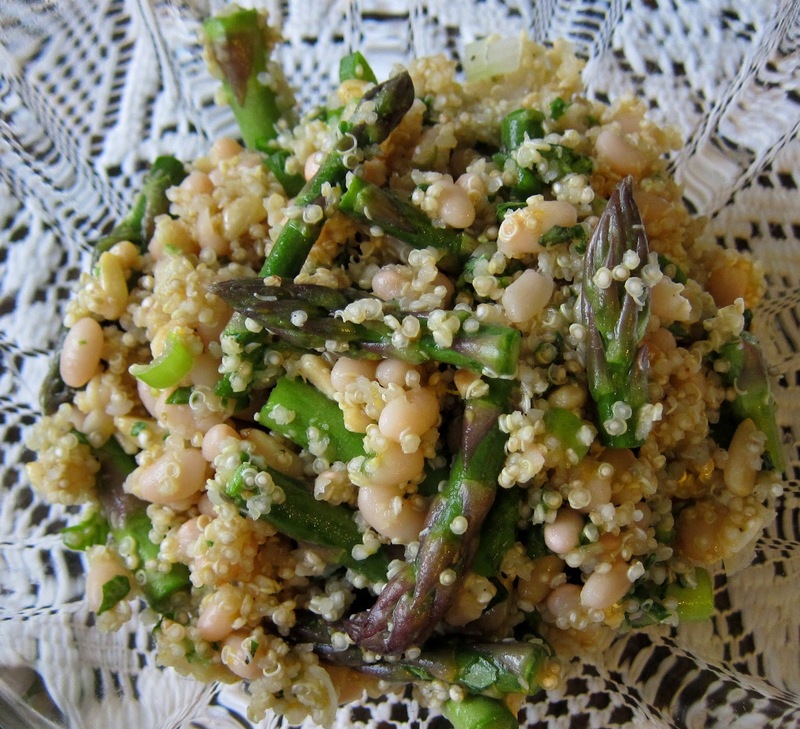 When quinoa is cool, combine with the beans, asparagus, basil, scallions, and pine nuts. Whisk together olive oil, lemon juice, lemon zest, orange juice, orange zest, and sea salt and freshly ground pepper to taste. Toss dressing with salad, and chill. Beautiful. Love the use of citrus with the quinoa. Fantastic presentation. Cheers! I would but I don't own one :(.